by Dr. Christopher Chang, last modified on 11/11/18. Before going into an explanation of why there are occasions when the ear doesn't feel right (ear fullness, clogged ears, fluid sensation) or makes unusual noises (ear crackling/popping), one must understand the anatomy of how the ear works when things are normal. If your ears hurt, click here. If your complaints are more "irregular clicking noise" in the ear, go here. 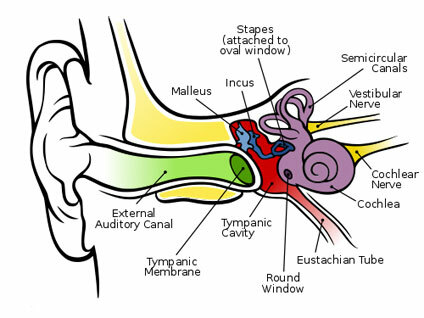 To the above right is a diagram of a normal ear with structures labelled (image by Chittka and Brockman from Wikipedia). The middle ear space (colored in with red) is an air-filled region of the ear that is cut-off from the outside world except for one 1.5 inch long passageway called the eustachian tube which opens into the back of the nose (shown 1 minute into this video). 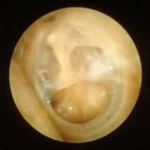 If the eustachian tube doesn't open normally, the middle ear space becomes isolated. When the eustachian tube functions normally, every single time you swallow, yawn, blow your nose, etc, your ear "pops". 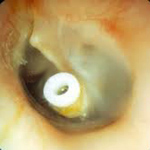 This popping is when the eustachian tube opens transiently allowing air to pass from the middle ear to the back of the nose which is open to the environment. Read more about how exactly this happens here. Watch a video of how this all works. Watch Video of How a Ear Pops Open Anatomically When Clogged. A more simplified video explanation can be found here. SO, why does my ear feel full sometimes? Assuming there is no earwax (or other factors) present which could cause symptoms of ear fullness or fluid sensation, for most people, the ear symptoms are due to their inability to pop their ears easily (or, open up the eustachian tube) or if even able to pop the ears, it fills back up quickly. Why would this cause ear fullness (and if severe enough, a persistent ear pain)? It's because there is a PRESSURE difference between the air pressure in the middle ear and the pressure outside across the eardrum. When there is a pressure difference, the eardrum either bulges outward (positive pressure) or bulges inward (negative pressure). Basically, when the eardrum bulges inward or outward, it creates a sensation of fullness for the person. Eardrum bulges inward when the pressure outside is greater than the pressure in the middle ear space (ie, occurs when a plane is landing or if you dive deep into water)... The first picture reveals a pressure of "30" outside the ear (remember, the ear canal is open to the outside) whereas the pressure is only "10" inside the ear. This will cause the eardrum to bulge inward until the pressure outside and inside the ear matches at "30". The bulging eardrum causes a person to feel ear pressure. After ear popping, the ear feels back to normal when the eardrum moves back to neutral position (no longer bulges). Eardrum bulges outward when the pressure outside is less than the pressure in the middle ear space (ie, occurs when a plane is taking off or if you drive up a tall mountain)... This situation is in reverse from that above. With the middle ear pressure of "30" being more than the ouside pressure of "10,", the eardrum bulges outward until the pressure inside and outside matches at "10". The bulging eardrum causes the ear to feel clogged. With ear popping, the eardrum moves back into neutral position and the ear feels back to normal. Normally in either situation, by popping the ears, the pressure difference will normalize (ie, no pressure can build up in a balloon if there is a hole) and the eardrum will go back into a neutral position. If the pressure difference is severe, the eardrum can bulge to the point it can pop like a balloon, a situation known as a perforated eardrum. Of note, people suffering predominantly from negative ear pressure are at risk of developing fluid in the middle ear which may lead to middle ear infections (otitis media) and hearing loss. So, what would cause the eustachian tube to not open up properly? Well, something could be physically blocking the opening of the eustachian tube in the nose, most notably large adenoids. In rare cases, it could even be a tumor. Endoscopy is required to evaluate for these possibilities. More commonly, the eustachian tube does not open properly due to inflammatory conditions, especially allergies, resulting in the tube becoming inflamed and swollen. That's why when people get a cold or allergies are bad, their ears also become affected. This condition is known as Eustachian Tube Dysfunction. Of course, ear infections can also trigger this condition. Watch a video demonstrating this. Treatment is based on the underlying condition. If due to large adenoids, adenoidectomy is the treatment. If due to Eustachian Tube Dysfunction, than treatment is with steroid and anti-histamine nasal sprays for about 3-4 weeks along with Afrin for 3 days (do NOT use Afrin or any other nasal decongestant spray for more than 4-5 days due to risk of rhinitis medicamentosa). These sprays are used differently than normal and instructions on the correct use can be found here. Throughout this time period, one must try to pop the ears 15-20 times per day (hourly) and also immediately after nasal spray use. Ear popping is actively performed by gently blowing out the nose against a nose pinched shut (about the same amount of pressure as if one has mild constipation). Popping the ears in this manner, especially after nasal spray use helps to squeeze some of the medication into the eustachian tube. Yawning and swallowing does not work as well. Another maneuver that may help in popping the ear (at least in the short-term), is to place your index finger about 1/2 inch into your ear canal and press firmly towards the top and back of your head. While pressing in this manner, yawn as widely and openly as possible. For young children (or even some adults) who just have trouble popping their ears, there are some devices that one can buy over-the-counter that try to pop the ears for you. A few such devices (like the Otovent) are shown here. Watch a video showing a 3 years old using an Otovent device or the EarPopper here. Whereas the Otovent essentially mimics only the valsalva maneuver (trying to blow air out the nose while pinched shut), the Earpopper simultaneously mimics the valsalva AND physically increases the eustachian tube diameter with swallow (muscles pull the eustachian tube open). Occasionally, systemic steroids and singulair are also prescribed. If these medications don't work, than placement of a tube across the eardrum often helps resolve the symptoms. Tube placement is generally recommended if a patient with eustachian tube dysfunction is about to fly, otherwise he/she may experience a very painful ear squeeze. Balloon dilation of the eustachian tube is also a potential option (more info here). If a patient has allergies or a sinus infection, these need to be addressed as well. Rarely, severe laryngopharyngeal reflux causes Eustachian Tube Dysfunction. Obviously, ear drops would not work since such drops would remain in the ear canal as it can't cross the eardrum to reach the eustachian tube which is the culprit for the cause of the symptoms. BEWARE!!! 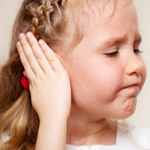 There are other reasons for ear fullness which may be present including mundane causes like earwax but also less common conditions including sudden sensorineural hearing loss, serous otitis media, fungal ear infection, Meniere's Disease, cochlear hydrops, endolymphatic hydrops, large tympanic membrane perforation, TMJ, acoustic neuroma, etc. As such, beyond an examination of the ear itself, one of the tests that needs to be performed before treatment is an audiogram. In some patients, this may be followed up with an ABR and/or even an MRI scan of the brain. So why does my ear sometimes make funny crackling & popping noises? Earwax or even a piece of hair could be lying on top of the eardrum and when the eardrum vibrates, it may cause funny noises (just like a piece of string on a lightly beating drum). Obviously, treatment is by removal. TMJ or temporo-mandibular joint disorders can cause noises that seem like it is coming from the ear as well. The TMJ is located immediately in front of the ear and noises from this joint can reverberate and "echo" into the ear. Treatment for this can be found here. The final possible cause of ear noises are spasms of the muscles found within your ear (stapedius or tensor tympani). Typically, the noise is described as "clicking" that is most definitely not rhythmic. It clicks in a random fashion about 1-2 times a second. This disorder is similar to eye twitches (blepharospasm) that afflict some people. Unfortunately, the only treatment is surgery. Read more here. 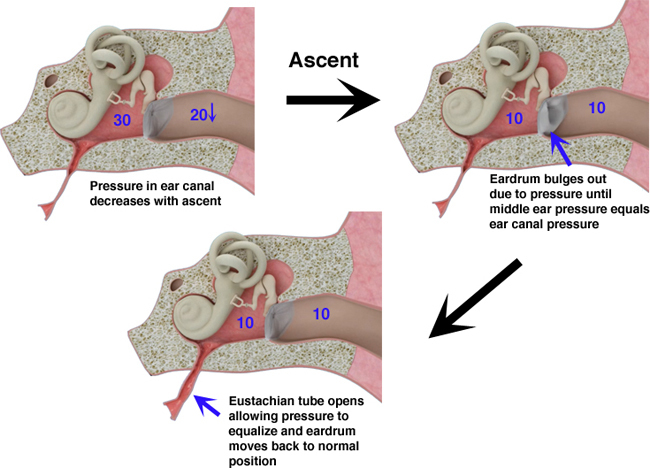 Can't the eustachian tube be kept permanently open to prevent Eustachian Tube Dysfunction? As a matter of fact, there actually is a medical condtion known as Patulous Eustchian Tube which is just that... a eustachian tube that stays open all the time. However, this situation causes problems as well. People with Patulous Eustachian Tube suffer from symptoms including hearing themself breath in and out all the time as well as hearing themself talk in their head as if in a barrel. Symptoms may temporarily improve when bending down for a few seconds, but return soon thereafter. Unfortunately for sufferers of Patulous Eustachian Tube, there is no treatment that works very well unlike for Eustachian Tube Dysfunction. SSKI, premarin drops, and reserpine are some not totally effective treatments. Perhaps the best treatment I've seen for Patulous Eustachian Tube is that provided by Dr. Dennis Poe at Massachusetts Eye and Ear Infirmary in Boston, MA. He performs a minimally invasive endoscopic insertion of a tiny catheter into the eustachian tube. The catheter is just the right size that one can still pop ears easily to prevent eustachian tube dysfunction, but large enough so that one does not suffer the symptoms of patulous eustachian tube. A promising new treatment called eustachian tube balloon dilation has been described in March 2011 to address eustachian tube dysfunction at the source surgically rather than indirectly with tube placement across the eardrum. In essence, a balloon is inserted into the eustachian tube and than inflated thereby opening it up (the balloon is "popping" the ear for you). The balloon is than deflated and removed. Click here to watch a video showing how this procedure is performed. Dr. Dennis Poe in Boston, MA is the researcher who has first described this technique in March 2011 and at this time, is not offered in many places. Why? Mainly because of lack of insurance coverage at this time as well as possible risks associated with this procedure. The material cost of the balloon is around $2000 or more. Compare this to the cost of a tube which is around $30 or less. HOWEVER, we expect that insurance coverage for this procedure may slowly change in the near future since this procedure has received FDA approval on Sept 16, 2016. In fact, our office is in the process of hopefully offering this procedure in the near future. Want to read more about eustachian tube dysfunction? Read FAQ here.